The ATI line of water treatment products is a comprehensive care system for your aquarium. Use ATI Essentials to work smarter, not harder, and supply all essential elements to your tank in one system. Let us do the math and chemistry for you, and get the most complete water test with our mail-in ATI Labs program, and use your results as a recipe for success to fine-tune your aquarium using ATI Elements for maximum coral health and growth. 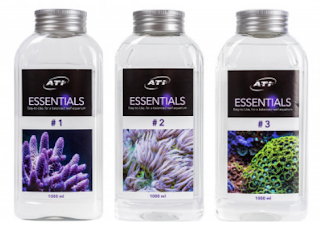 ATI Essentials provides a complete support system that can be easily tuned to the needs of your aquarium. In addition to calcium, magnesium, and carbonates, ATI Essentials includes all necessary trace elements to support the biology of your aquarium. ATI Elements give you complete control to fine-tune the amounts of trace minerals your aquarium needs. With these individual adjustments, you can achieve better results, giving your coral more growth and more vivid color. ATI Labs, you get a more comprehensive water analysis than typically available, and a personal online portal to access and track your results each time you test.